Christopher Bristow with a 21.5lb Catfish caught on December 6th right before closing near the ADA Pier. Big cats are continuing to be caught weekly! Fishing permits, boat rentals, bait, and tackle are all sold at the Concessions Stand right next to the Ranger Station in the Lakeshore Area. Anglers “Must!” purchase a fishing permit before casting out to catch the big one. If you desire to fish with a second pole, make sure to pick up a second rod permit for an additional $2. We do not require a state fishing license but do strictly enforce the required permits and fresh water regulations. Trout: In the early morning hours, you can round up a few trout in the shallower waters of Trout Cove and near Pier 1. Although, it is the Buoy Line that you want to put your fishing emphasis on. Fishing is still strong from the boats but slowing on the shoreline. A two-pound test set up with a one foot to 18inch leader is recommended. Garlic Powerbait and Nightcrawlers are creating a strong bite near the Buoy Line but not showing the same results from the shoreline. We do suggest to start your shoreline fishing early as access to deeper water from the shoreline is limited. While fishing from the shoreline, it is recommended to go with the set up listed above but, also try using small jigs and/or Powerworms. Our next stock is coming in January 3rd with a total of 1500lbs. The Trout catching limit is 5! 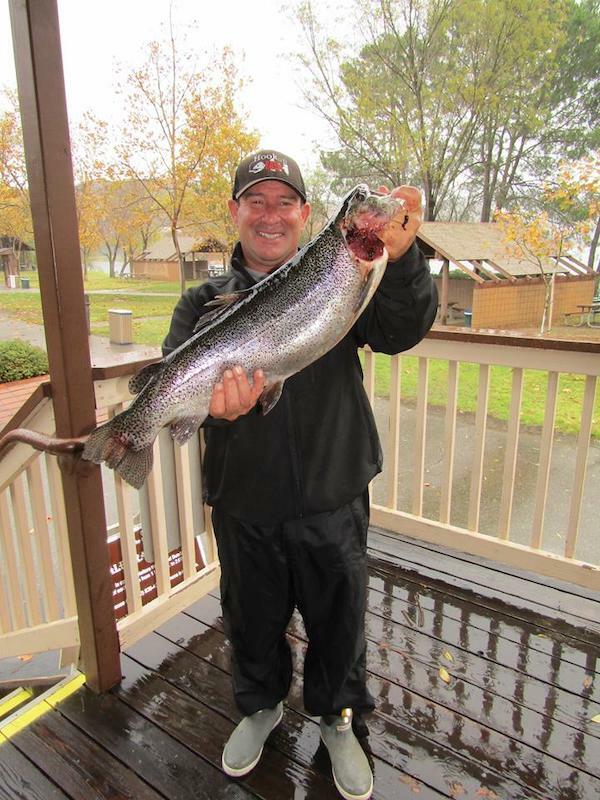 “No Catch & Release of Trout” Tim Garner caught a 10.12lb Trout in trout cove a little over a week ago. The Catfish bite has picked back up due to the rain and recent trout stocks. 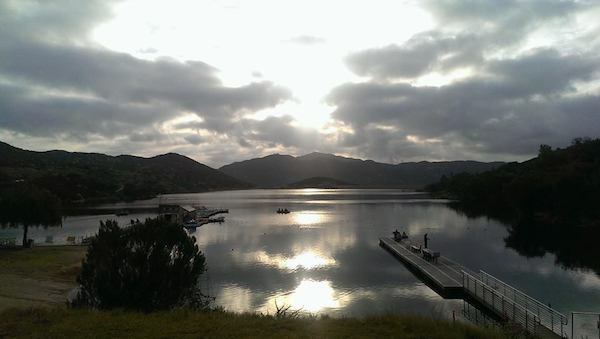 The productive areas have been Trout Cove and Jack Creek Cove in the early morning and late afternoon before closing. 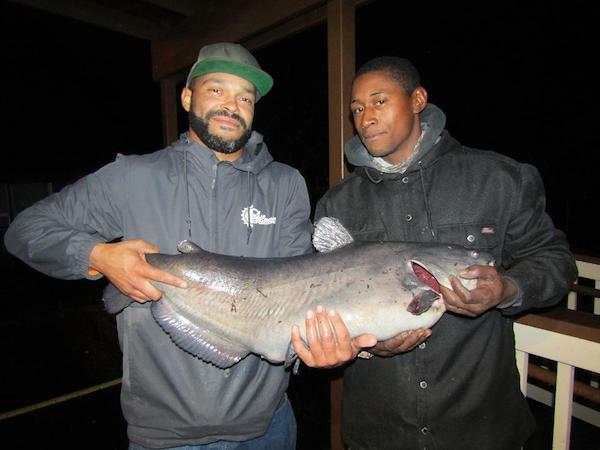 Christopher Bristow (21.5lb Catfish) and Johnny Tate (15.1lbs) both caught their big fish on and or near the ADA Pier. Mackerel was the bait of choice to get the larger fish. Bluegill have slowed down and pushed into deeper waters. Mealworms, and cut up night crawlers have been good choices for catching blue gill in the past few weeks with the majority of them being caught in the early morning and afternoon hours. The Buoy Line is producing large size fish at this time. Bluegill are limited to 25 of any size at this time. There is a ban on private water craft and equipment at this time. Restricted equipment includes; private boats, canoes, kayaks, float tubes, trolling motors, fish finders, anchors, and other equipment that contacts the water. Tim Garner with a 10.12lb Trout caught in Trout Cove back on December 6th. Great Catch!